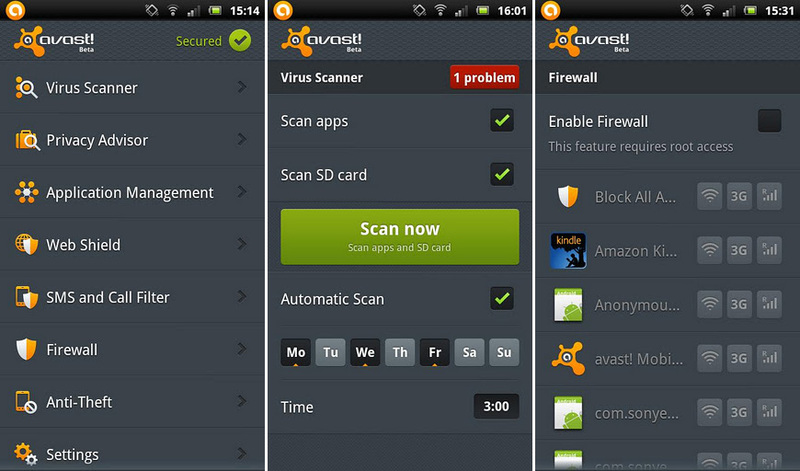 Free download latest version Avast Mobile Security for Android is totally free application. It is an antivirus secures your Android phones from spyware, viruses and malware functions. This app is very light and easy to use and one of the best apps to secure you Android phones, you don’t need to worry about the virus threats. Avast Mobile Security has a great feature of ‘anti-theft’; you have to set this when you buy an android phone or before it has been stolen. After set this feature you will be able to locate your phone, you can wipe your all important data, set an alarm and many more remote actions you can do and the most interesting thing that it will be invisible to thief. You need to some extra work to set this feature. If you want to enable Firewall then you have to ‘Root’ your Android phone. This latest version of Avast Mobile Security has extra features like; firewall, app manager, call filter, has a privacy shield and most important it has anti-theft, all the previous bugs are fixed now, it scans the SD card, has a feature to increase the speed of CPU during scanning process and much more. It has very simple interface, you just need to click on your desired and right option.